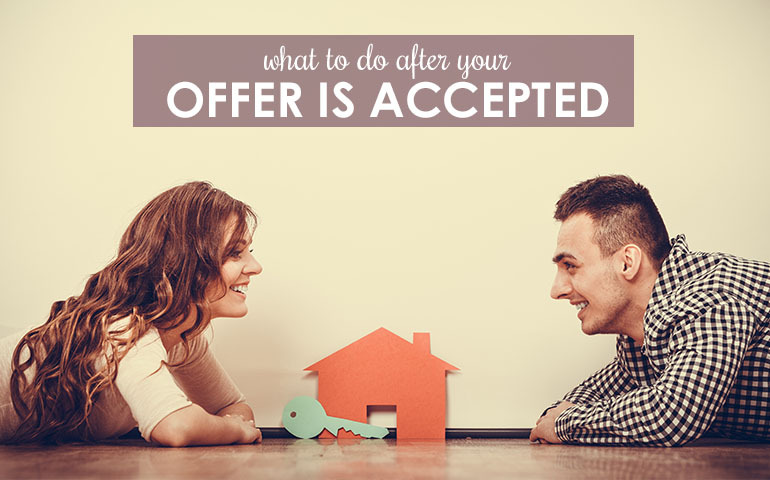 Congratulations, Your Offer’s Been Accepted… Do These 10 Things Next! As a homebuyer who has just received the news that your offer has been accepted, you may be tempted to break out into a happy dance. Woo hoo! You're one step closer to homeownership. Once a buyer’s agent calls with the news that a seller has accepted their offer, typically a 30-60 day closing process is set into motion. During those 30-60 days, there are a few things that buyers need to stay on top of. Sign the Purchase Contract: Of course, this a logical first step on the road to closing; but, if a buyer and seller have been negotiating back and forth on price or any included items in a home sale, both parties need to sign the contract in order to put the closing process into motion. This contract also should include one other necessary piece: an agreed-upon date for closing. Apply for a Loan: OK, many home buyers begin their home searches armed with loan pre-approval, but if you’ve placed an offer without it, it’s time to begin the mortgage application process. Even if you’ve got pre-approval, you’ll need to alert your lender that you’re ready to take the steps necessary to finalize that loan. Schedule Appraisals and Inspections: In most cases, a buyer’s lender will arrange for a home appraisal; but, buyers are typically responsible for scheduling their own home inspections. These inspections should include a general home inspection, but also may include others, like radon or pest inspections. Arrange for Repairs: If a home inspection unveils damages or needed repairs, buyers should request that those repairs be completed before their new home’s issues legally become their problems, which will happen after closing day if they are not addressed before that time. Find Homeowner’s Insurance: Believe it or not, homebuyers, you need to have your homeowner’s insurance in place before your new home is actually yours. Your insurer needs to have your policy in place before you head to the closing table. Alert Necessary Parties: If you’re renting, you’ll need to inform your current landlord that you’re moving out, in order to avoid any possible penalties that may be included in your lease. You’ll also need to transfer over your utilities or arrange for new services to be put in place for your targeted move-in date. After all, things like water, heat and electric may be necessary while moving in. You may also want to make sure that services like cable and internet are arranged in advance, too! If you’ll need some moving help, hire moving companies or reach out to family and friends who may be able to help you move. Make Sure Needed Funds are Available: Buyers may need to come to closing with a cashier’s check for the remaining amount of any closing costs. Scrambling to the bank on the day of closing to obtain the check may not be something that a buyer wants to do. So, once that closing date is set and everything is proceeding as planned, buyers should make sure they’ve got that necessary money in hand. Complete a Final Walkthrough: Often times, buyers and sellers agree that some items should stay with a home. For instance, things like blinds or other conveying items need to stay in place when a home is sold. So, buyers should complete a final walk through a home before heading to the closing table. This way, they are 100% comfortable accepting their new home just the way it is! Go to Closing: Yes, this may seem like a no-brainer of a step; but, you’ve got to put your final signatures on those closing documents for a home to be yours! Go to the closing table prepared, so that there are no last-minute hang-ups, like scrambling for funds or missing documents. Move in: No one should need to tell a new homebuyer to complete this final step; but, it makes our list solely based on the fact that move-in day is the final sign that your real estate transaction is complete! It signals the time for congratulations and a celebration!